Wontons can be nice if cooked well. Crispy layer on the outside – you bite into them and they give you a bag full of flavors – depending on what you’ve ordered off course. So this one time, we headed to Trader Vic’s Mai Tai Lounge at Orion Mall, Bangalore. 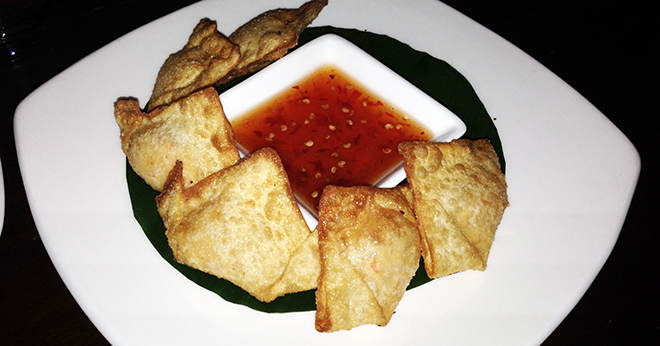 Saw something interesting on the menu called Crab Rangoon. A close friend of mine Rakesh was with me and we instantly ordered the same. When the dish was served, picked one up and popped it in – holy cow! It was one of the most yummiest things I’d ever had! Think about spiced crab and cream cheese hitting your palette when you bite into a crisp wanton – yup, that’s exactly what happened! The dish but ofcourse, did more than a couple of repeat rounds and tell you what – this is one dish that I highly recommend!